NASA is developing technology which could enable autonomous navigation of future underwater drones studying subsurface oceans on icy moons like Jupiter’s Europa. The agency is working on artificial intelligence (AI) that would allow submersibles to make their own decisions during exploration of extraterrestrial water worlds. Space exploration missions and astronomical observations in recent years have shown that our Solar System is abundant in water and could host at least several subsurface liquid oceans. The scientific community assumes that water exists beneath the crust of Europa, as well as on other icy moons like Saturn’s Dione and Ganymede. Compelling evidence of hidden oceans on dwarf planets Ceres and Pluto has been also presented recently, proving that many mysteries may lie deep underground these frigid celestial bodies, waiting to be uncovered by underwater robotic explorers. NASA is aware of the emerging challenges that it must face if it wants to successfully explore subsurface oceans on Europa and other icy worlds. Such underwater drones would focus on searching for microbial life in this harsh environment which strongly impedes nominal communications with mission control on Earth. Therefore, the key issue here is to develop a highly-autonomous submarine-like probe capable of making decisions on their own in real-time in order to continue exploration and research uninterrupted. “Depending on the exact mission concept under consideration, autonomous underwater vehicles exploring ocean worlds will need to operate autonomously for days to months. Within this timeframe they must manage their own resources, explore a largely unknown environment, including navigating to and from a single point of insertion which also serves as a communications link to the outside world,” Steve Chien of NASA's Jet Propulsion Laboratory (JPL) told Astrowatch.net. 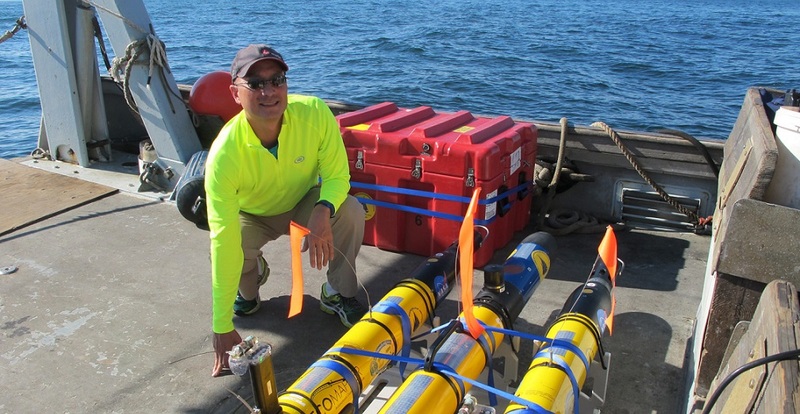 Chien leads the Artificial Intelligence Group at JPL which is currently developing AI for underwater drones. From August 26 to September 4, 2016, the team tested a fleet of coordinated drones in Monterey Bay, California, with the aim of detecting changes in temperature and salinity. The fleet that was tested includes three autonomous underwater vehicles (AUVs), two ocean gliders, and one Tethys-class Long-Range AUV. The system is complemented by a 300-meter resolution ROMS (Regional Ocean Modeling System) free-surface, terrain-following, primitive equationsocean model developed especially for this project and a suite of planning software. The software identifies the location of specific scientific targets based on the ROMS output and autonomously determines the optimal sampling strategy for a heterogeneous array of autonomous vehicles. During last year’s test runs, the fleet of these six small submersibles sensed how the ocean actively changes around them what is essential for the development of autonomous navigation systems. The gliders were deployed earlier in the summer to provide over a month of data prior to the intensive field program. These tests were part of the team’s continuous effort to design and plan future autonomous vehicles with the focus on further refining and demonstrating AI technologies. Next set of test runs is planned for the spring 2017. Given the fact that the main goal of future underwater drones exploring subsurface ocean would be looking for microbial lifeforms, Chien proposes that the probes should concentrate on searching for fissures in a planet's surface known as hydrothermal vents. These features that are commonly found on ocean basins are perceived as potential life supporting environments due to geothermally heated water they emit. Furthermore, more general characterization of such an alien underground watery world would be also needed as it is a totally unknown and unexplored realm. The team is convinced that their project will provide a framework for designing robotic missions to extraterrestrial ice covered oceans. “The vast majority of space exploration is conducted by robotic probes. Increasing the autonomy in future missions is essential to both increasing the effectiveness of space exploration as well as exploring more distant, challenging environments, such as sub-ice oceans,” Chien concluded. NASA should have some mobile application for the audiences around the world those love astrology and to understand the real things. Thanks for writing such a great post. We launched a website as well for Pakistan Super League to watch PSL live stream. We all know that the NASA is doing the greatest jobs in the field of defense and space. NASA is not only doing challenging jobs in one field ,that is like one of the best essay services in the Space technology.Once again this a mark in the NASA history. Check out this blog with numerous helpful articles, guides, tips and tutorials from advanced and successful writers and bloggers.